Never have heavy equipment users had so many choices in machinery as we have now. Newer machines are smarter, more efficient, and more versatile. New models that fit in between previous versions can add versatility to your fleet. Compact equipment is especially popular. But should you stick with traditional skid steers, or switch your allegiance to a track loader? Some operations are going with both. That way, they’re covered no matter what the next job or changing ground conditions require. But, as always with equipment purchase decisions, it comes down to trade-offs. These machines have become so popular, they are selling faster than skid steers. One reason is their superior traction in situations where flotation can keep a machine on the job instead of mired in mud or scrambling in deep gravel. Track loaders are winners when it comes to power and torque. They provide higher rated operating capacity than a comparable skid steer. They are also heavier. That can be an issue when transporting the machine, especially if it requires a larger trailer that will, in turn, require the driver to have a CDL. Track loaders have a bigger footprint than skid steers. That gives them better traction and stability in certain conditions, because they have lower ground pressure. But there’s also more rubber to wear out. Faster wear translates into higher replacement costs. Skid steers offer a different type of traction, with four points of ground contact instead of the solid track, so they tend to be a better choice for hard surfaces. They can travel faster than a track loader. That saves time (read: money) when machines must travel around job sites or from one site to another. Their higher ground pressure is well-suited to surface compaction projects. It’s easy and efficient to switch attachments as needed for different aspects of the work, making the machine a versatile tool. Skid steers are also more efficient snow pushers, thanks to that higher ground pressure. The machine can exert as much as 30-35 pounds of pressure, where a track loader may only generate 4 or 5 pounds. Tires are tougher than tracks when it comes to working on potentially harmful surfaces such as in a scrap or recycling yard. Even gravel can become a problem for tracks, with pieces becoming wedged between the moving components. Turning under load can also wear tracks faster, which can make skid steers a better long-term choice for lift-and-load operations. 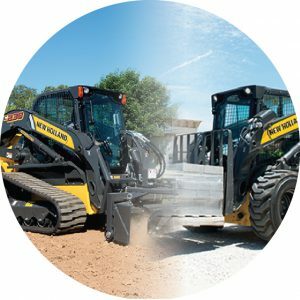 Often, a skid steer is more compact than an equivalent track loader, which can be an advantage in landscaping or urban environments where space is tight. Another factor working in favor of skid steers? Familiarity. If you’ve been happy with your existing skid steer and it’s time for a new machine, why not simply purchase the newest, feature-rich model instead of buying a different piece of equipment? Predictability and (perhaps) a shorter learning curve for operators can make the new machine/operator combination fully productive sooner, say some owners. How does total cost of ownership compare? Choosing the right compact equipment for your fleet depends on multiple factors and your long-term business goals. But one key factor is always cost. When it comes to initial price, skid steers cost less. But the margin is a lot smaller than it was just a few years ago – on average about 5% to 10%. Tracks are more expensive and more labor-intensive to maintain than tires, and replacing tracks costs more. (That said, replacement tracks are more affordable than they were a few years ago, too.) Skid steers are more fuel efficient, but a track loader can be more productive in the right applications. When you look at all the pros and cons of each machine, it’s easy to see why some firms are choosing to keep both types of compact equipment in their fleet. The two are simply different. If you can afford to own both, then you have the right machine for the job no matter what your next job entails. If not, it’s a balancing act.